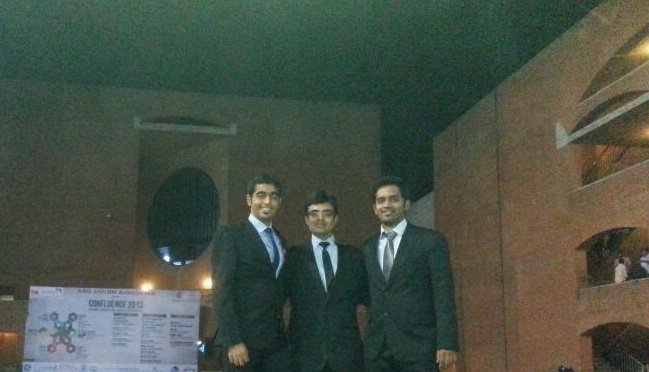 Confluence, IIM-Ahmedabad’s International Business Summit, was held during Nov 29-Dec 1 this year. The summit, themed “Traversing Turbulent Times – Obstacles to Opportunity”, is the largest of its kind in the Asia-Pacific region. One of the popular Finance events, ‘M&A Frenzy’, involved the valuation of firms on the verge of potential acquisition. The event was carried out in three stages and registered the participation of 383 teams from 278 B-schools globally. Round 1 was an online quiz The Top-42 teams were shortlisted for Round 2. This also marked the beginning of Team tRichyRich’s (Prajwal, Pratik and Sumit ) hard-fought journey to victory. In December 2013, Team tRichyRich from IIM Trichy emerged winners in ‘M&A Frenzy’ at IIM A, ahead of IIM A (First Runner-up) and ISB Hyderabad (Second Runner-up). “Of course, we were really excited after being shortlisted but we knew that the next rounds were going to be quite challenging”, says Pratik Gupta of Team tRichyRich. Pratik , a graduate of BITS Pilani (Goa) joined IIM Trichy hoping to delve deeper into the disciplines of Operations and Finance. After a month into campus, Pratik formed a study group with Prajwal and Sumit to work around case studies and assignments. So here were 3 students who shared common interests, modestly aiming to negotiate a term. But what motivated competitive spirit? “After completing the first term, we felt that we should get a better picture of how we matched up in comparison with other fellow grads from different MBA schools in India”, chips in Prajwal Nagaraj, a district-level cricketer. Following Round 2 which involved the presentation of a buyers’ pitch in the event, 6 teams were sieved out. Apart from tRichyRich, the shortlist included teams from IIM A, ISB Hyd, IIFT Delhi, IIM Indore and UPES Dehradun. The final hurdle to victory was thus intensified with tough completion from top-notch teams and highly competent participants. “Presentations are always difficult. We knew we’d face tough questions but we were confident with our preparation”, says Sumit Panjwani the numbers-addict of the team. After the presentations and panel questionnaire ended, the verdict was declared. And the verdict is a writing on the wall. We at IIM Trichy believe in our people-our students and our faculty. After all it is people who form the bulwark of great institutes. IIM Trichy is a mélange of backgrounds, skills and talents. Be it IITs, BITS or NITs, engineers or literature graduates, ace-sportsmen or stage performers, IIM Trichy is proud home to them all. Our students are consistently striving for excellence and our faculty is thoroughly guiding them on their way. Our placements and our achievements are merely testament to the training received in class from our professors. Gyanam Anantam! ← So long… and thanks for all the magical moments!